Now a holiday season is coming! 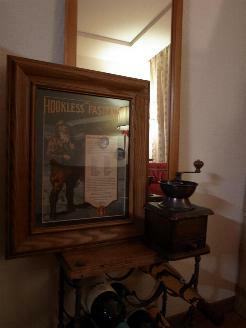 issued by HOOKLESS Fastener Company in my living room. The image can be found on page 26 in the book ZIPPER GEAR. It was made in 1927, when one year before the name of TALON had appeard. that Charles A. Lindbergh succeeded in a solo crossing of the Atlantic Ocean. instead of raindeers hooked up to a sleigh. There are two characteristics on the flyer. First, its way of promoting. its application products. Please refer to the following enlarged text. that can cover from children to grown-ups, type of indoor to outdoor. but the firm clearly tried to stimulate consumers' appetite with the list. Second, the ad was put into some thought by the company. which cost a lot. It was needed to make differences from its competitors. 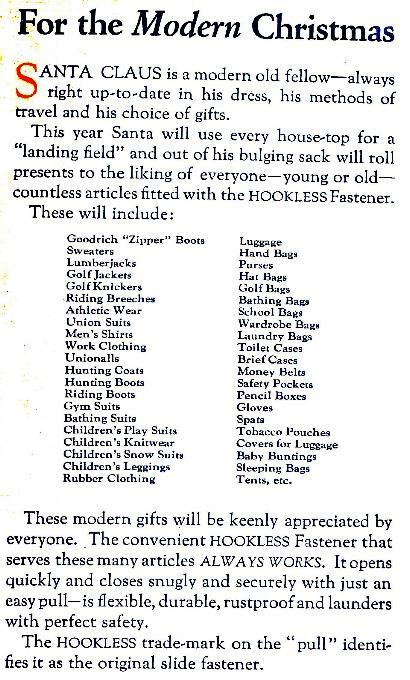 "Purchase only the goods with zippers inscribed HOOKLESS!" because low-quality zippers producted by other companies suddenly went around the market. and ended up a decline in sales. the market competition among the zipper industry had grown severe.